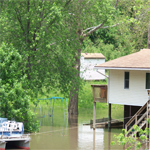 Heavy rains often cause flooding in lowland areas, homes and basements. The prospect of an electrical accident is probably not top of mind when you’re dealing with a flooded basement, room or even outdoors. But, it’s the first thing you should think of before you step foot in the water. Safe Electricity reminds everyone to be alert to electrical equipment that could be energized and in contact with water, along with other potential hazards that create a serious danger of electrocution. Cleaning up and using water-damaged appliances also carry safety risks. Safe Electricity urges parents and other caregivers to make sure children are aware of these hazards as well. Never step into a flooded basement or other room if water may be in contact with electrical outlets, appliances or cords. A good safety measure is to have ground fault circuit interrupters (GFCIs) professionally installed on outlets. These safety devices can cut off power instantly if there’s a problem. GFCIs are recommended for outdoor outlets, and outlets near wet areas of the home such as kitchen, bath and laundry room.